High-pressure laminate top is moisture-, scratch- and stain-resistant. Drawers operate on steel ball bearing slides. Tru-fit mitered drawers with a removable core lock. Cord management grommets and modesty panel. Not freestanding. Attach to Single Pedestal Desk or L-Workstation Desk to create an L-Workstation. 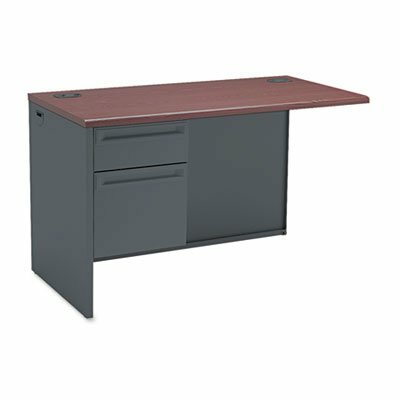 Color: Mahogany/Charcoal; Pedestal Count: 1; Drawer Configuration: Left: Box/File; Overall Width: 48". Not freestanding. Attach to Single Pedestal Desk or L-Workstation Desk to create an L-Workstation. Drawers operate on steel ball bearing slides.